Long in the works, Salad Days: A Decade of Punk in Washington, DC 1980-1990, is premiering as part of the DOC NYC fest in NYC tonight (11/14). Expected to attend: Scott Crawford, producer Jim Saah, film subjects Michael Hampton (S.O.A., Embrace), Tom Lyle (Government Issue), Bert Queiroz (Untouchables, Double-O, Youth Brigade), and Jenny Toomey (Tsunami, Simple Machines Records). 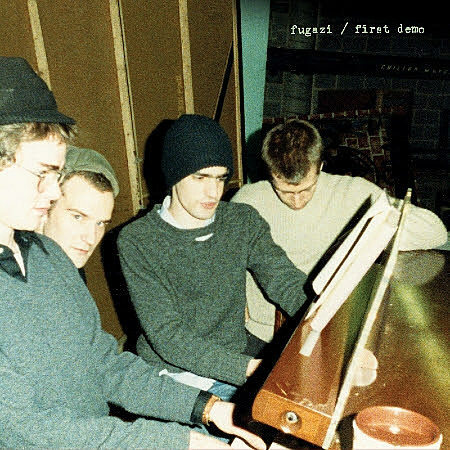 Fugazi’s First Demo is now streaming it its entirety ahead of the official November 18th release date. In early January 1988 and after only ten shows, Fugazi decided to go into Inner Ear Studio to see what their music sounded like on tape. Despite the fact that Ian, Joe, and Brendan had been playing together for nearly a year, it was still early days for the band. Guy had only been a full member of Fugazi for a few months and only sang lead on one song (“Break-In”). The sessions only lasted a couple of days, but tour dates and indecision about the tape would delay the final mix for another two months. Though the band was at first pleased with the results, it soon became clear that this tape would remain a demo as new songs were being written and the older songs were evolving and changing shape while the band was out on tour. It was decided that the session would be passed out free as cassette copies, with the band actively encouraging people to share the recording. In the spring, Fugazi went out on its first U.S. tour and a few weeks after returning from the road they went back to Inner Ear to record what would become their debut Dischord release, the self-titled 7-song 12″ EP. The only song from the demo session that was formally released was “In Defense of Humans”, which appeared on the State of the Union compilation in 1989. Now, some 26 years later, Dischord is releasing the entire first demo including the one song (“Turn Off Your Guns”) that wasn’t included on the original cassette.